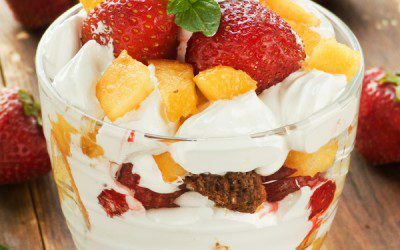 In an 8-ounce glass, layer strawberry slices, peach slices, and raspberries; set aside. In a small dish, whisk together sour cream, Splenda, and almond extract. Top fruit with cream and garnish with fresh mint. Exchanges per serving: 2 fruit, 1/2 other carbohydrate. Carbohydrate choices: 2 1/2.